Occupy Wall Street was soooo cool. I commuted from my aunt’s house in Manhasset to Zuccotti Park every day. We stuck it to the man. We told it. No way we’ll pay those friggin’ college loans. And listen. The capitalist model is dead, soooooo dead. Ownership is gone, man. I read all about it during the group pow-wows and dinners (good food donated to the cause, bro) at Zuccotti. This book, called Free Ride, gives us the 411. 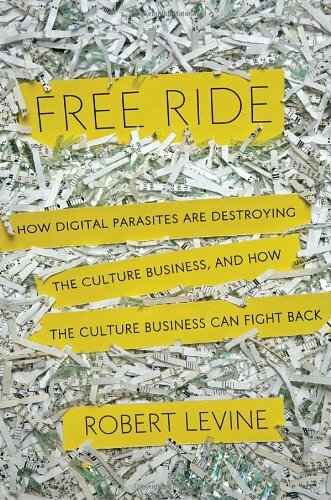 The Net is taking over, that’s what the guy who wrote it—Robert, uh, Levine says. He’s on the case. It’s all gonna be free—TV, books, movies, music. Information is free, baby—FREEDOM! You know that guy who owns Google, that Russian guy Sergey? He knows where it’s at, man. He told this old guy, some New Yorker magazine guy who writes stuff. He told the New Yorker guy that more people would read his book if he put it online for free. That’s so cool! But the New Yorker guy said that he had to make money somehow, and he wasn’t going to do it. What’s that all about, huh? Information wants to be free. Why should people exploit other people just because they wrote something? Fight the power! Sergey is cool. This Levine dude says that Google just went ahead and scanned 15 million books—screw copyrights—and didn’t even ask permission. They rocked. No way some guy can monopolize things with a copyright just because he spent a few years writing it. Google is the Liberation Express—besides they need something to push those neat advertisements onto the web. But this guy Levine is bad news. He’s not with the program. He thinks file sharing, burning music tracks and pirating flicks is, like, wrong. He’s into ownership, creator protection. Levine must be part of the machine—another tool in the capitalist workshop. Who’s he trying to protect? THE MAN? Amazon is cool, Apple is cool . . . they’re part of the liberation theology, Dude! iPads, Kindles, that’s where it’s at. Books on a Kindle are just blades on a razor—it’s the razor that matters, right? There’s this other guy the Levine guy writes about—Larry Lessig. He’s a totally rad professor—and superbad, too. He wants to shift all the power to the Net. Google’s helping him, giving money to his groups so they can free the Net and do cool things and sell advertising. It’s all interlocked. It’s going to free us, I’m telling you. Just wait till there’s free TV. It’s coming, my man. Boxee, Rapidshare—they’ll stick it to Hollywood, all those writers and actors, big studios. Who needs studios when you can have Google TV? I mean, Google doesn’t need to create shows, cha. They’re already good at snatching them off the box now, right buddy-boy? I mean, what the hey? That’s what YouTube’s all about—and Google owns it! Listen, Frozen-Face, this country’s one percent is keeping the other 99 down. Anyone trying to force people to buy stuff through the mega-corporations needs to be put down. The Net can do that. All it takes is some software and storage. You gotta read this book, Billy-Bob. It’s just that I have to find a way to hack a digital copy so you don’t have to pay. Why should this Levine dude make money off us, right? Authors get outta the way! Words are free, baby. Thoughts are free. Stop sticking it to the people. If people want me to read some book or listen to their music, I don’t have to pay for it. That’s what the web is all about. That’s what democracy is all about.